Enjoy our delightful brand new holiday home. A perfect gathering place for the extended family to make memories. 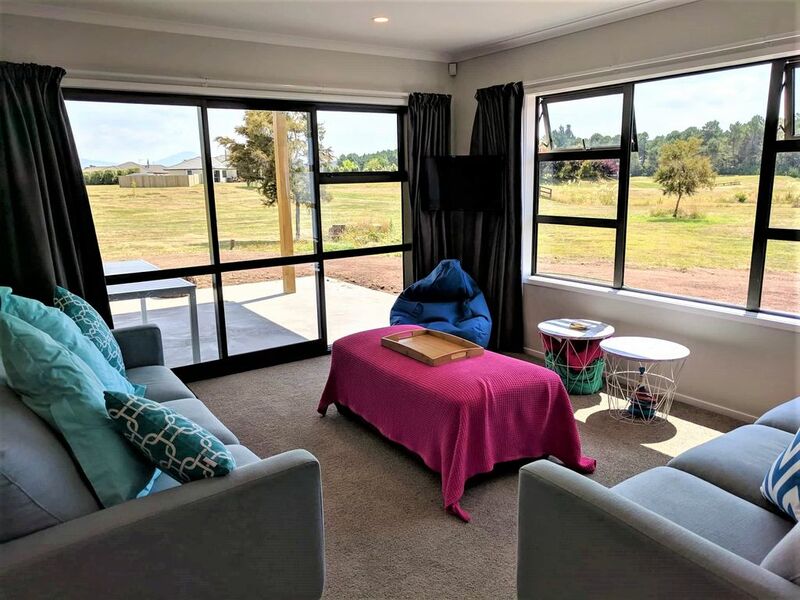 “Manawa” (meaning Heart in Maori) sleeps 10 comfortably in the house with overflow to sleep 12 in the insulated and carpeted garage on a fold out couch. From the front door, this little gem opens up into the living space with outlook onto the covered patio and onto the reserve. Dining sits 10 with extra stools and chairs dotted about to fit everyone in. Living area sits 6 comfortably on couches with a comfy ottoman and 5 bean bags to accommodate larger numbers. Multi-purpose garage space with laundry (with washer, dryer and 2nd fridge for larger groups), fold out bed for sleeping 2 extra. Table tennis table, general rumpus room area for the older kids or kidults. Board games stored in the ottoman. And on those warm balmy summer days, enjoy the covered outdoor area for a lazy afternoon. Easy to keep an eye on the little ones as they play on the adjacent playground (1 of 3). Tennis court, basket ball hoop and petanque area just 200m along the road. Plenty of parking for several cars and your boat. Motuoapa is a great community to holiday in. Enjoy hikes, white water rafting, skiing, fishing – it’s all at our doorstep. 10 mins walk to SH 1 to enjoy a cappuccino at the local café or stroll to the marina. Enjoy a 5 min hike up the hill to the viewing platform over the area. We live in Porirua, New Zealand with family living here in NZ as well as the UK. We are fans of travel, outdoors, music, and taking time out to relax. And we especially like spending time with our young grandchildren. We built "Manawa" as a gathering place for our growing extended family, as we know how important it is to have a place to spend some quality time together. Other family groups will enjoy this fun space and all the area has to offer. Covered area, with BBQ and outdoor dining table and chairs. Enjoy hikes, white water rafting, skiing, fishing, horse treks, cafes – it’s all at our doorstep.